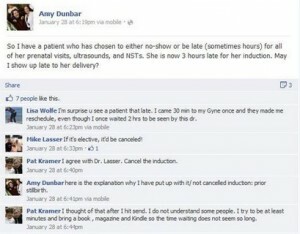 Frustrated by what she considered a patient's chronic lateness, St. Louis, Mo., OB-GYN Amy Dunbar took to Facebook to share petty complaints and personal information about her. In addition to jokes about "showing up late" to her pregnant patient's delivery, Dunbar also divulged that this woman had previously delivered a stillborn child. That was a really bad idea, say hospital officials and medical ethicists. But whether her lapse in judgement is grounds for firing remains to be seen, according to her employers at St. John's Mercy Medical Center. In a statement from the hospital, officials avoided talk of concrete disciplinary action: "Her comments were definitely inappropriate. We are also reviewing them to determine if they violated privacy issues... That process requires a more thorough review, but we will determine the appropriate response as quickly as possible." Dunbar didn't reveal her patients name in the post, but critics say there may have been enough information for readers to guess at her identity. Supporters argue that it's only natural for a doctor to let off steam about patients on Facebook, and that doing so, while leaving identifying details out, doesn't constitute a violation of privacy. It's the weird, murky Internet world we live in. What might have once been an offhanded comment delivered over terrible hospital cafeteria food was instead documented for public consumption (and media screen-grabbing). It's a reality that many hospitals have responded to with book-length policies around social media and patient privacy. “We first have to put ourselves in the shoes of the patient we may be discussing and then reflect if what we’re saying is appropriate," he said.